To be a successful facility manager you have to be an effective communicator, plain and simple. In facility management, comprehensive and consistent communication is key. This applies to both incoming communication from a contractor and outgoing communication to clients. Effective facility managers are in constant communication with project managers regarding all aspects of a job. That way, they can document and communicate any essential details of the project like estimates, quotes, and timelines to their client on an ongoing basis. Poor communication or even worse, a complete lack of communication, comes with the risk of delaying projects or driving up costs. This is a recipe for a disaster and a surefire way to find yourself in the unemployment line. Certain careers require extra attention to detail and facility management is no exception. With all of the numbers, figures, files, and forms involved with the job, someone with a short attention span could easily become overwhelmed. Not so for your typical facility manager. These rock stars tend to be extremely detail-oriented, and they have to be. Even a minor mistake or small detail missed, like an inaccurate measurement, can completely derail a project or result in a code violation. From reading contract fine print to finding the best contracting quotes, nothing gets past a detailed-oriented facility manager. 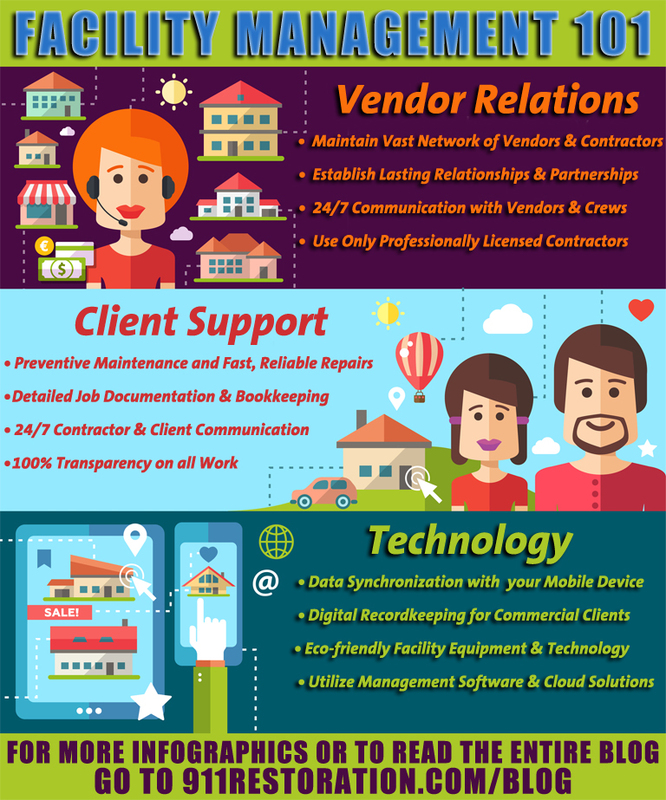 From new clients to your network of contractors, building and maintaining strong relationships is an essential part of successful facility management. The most successful facility managers usually have a long list of plumbers, repairmen, and contractors they can call when their clients are in need of maintenance. They’ve built up their contacts over the years and know who they can trust to do a good job at a great price. If you’re currently an assistant property manager or just entering the facility management industry, it’s very likely that your network of contractors is limited. That’s okay — everyone has to start somewhere and with a little hard work, your partner list will grow. In the meantime make sure to network as much as possible, both online and in person. Also, go to trade shows, industry conferences, and networking events. Online, join Facebook and Linkedin groups that focus on facility management. And finally, remember names and always get that all-important business card to put in your facility management Rolodex. Click on the facility management infographic to expand and save! On a daily basis facility managers have to analyze tons of information and then make decisions based on that data. Due to this fact, being analytical is an all-important skill to have in this industry. Things like estimates, quotes, and timelines need to be analyzed in order to make important business decisions that affect both clients and contractors. Additionally, knowledge of budgets and financial planning will help you succeed as a facility manager. This isn’t to say that being a math guru is necessary in order to be a successful facility manager; it just means that you have to be sharp and results-orientated. With this in mind perhaps the most important “figures” to know and analyze are your client’s specific KPIs, or key performance indicators. Knowing a company’s goals can help you determine where to spend money and how to allocate resources. Exceptional organization skills can take you a long way in any career, and this is especially true of facility management. Managers that are able to effectively analyze, process, and then organize all of the information given to them daily do quite well in the industry. In fact, the most successful facility managers tend to be organized both online (sometimes with the help of facility management software) and in person, keeping detailed records and utilizing efficient filing systems. Being organized is either something you have or you don’t so if you’re in the former group, facility management might be the field for you. The best facility managers are cool, calm, and collected in an emergency because they’ve already prepared and pre-planned for these situations in advance. Being prepared for an unexpected disaster, whether it be an earthquake or cyber attack, involves putting safety measures in place before disaster strikes. Things like emergency plans, backup data storage, and cloud-based systems can go a long way toward helping your client get back to business much faster after an unexpected emergency. While you can’t possibly plan for every disaster, this well-prepared mindset will help minimize both costs and time lost. This is music to a client’s ears because in business time is money and even being closed for 24 hours can have a dramatic effect on a company’s bottom line. Along with disaster preparedness, building safety is a key aspect of facility management. Things like indoor air quality, HVAC systems, building materials, and smoke alarms are all building safety issues that require the attention of a facility manager. While a law degree isn’t required to effectively perform the job, knowledge of local, state, and federal laws is needed in order to keep clients in compliance. Facility managers need to know various safety codes, laws, and regulations or risk potential serious penalty. Penalties include everything from health code violations, to monetary fines, to a temporary or permanent close of business. While knowing your way around the building is a good start, additional training may be required for facility managers to ensure that all laws and codes are followed. In fact, organizations like the International Facility Management Association (IFMA) offer certification programs for facility management professionals to show industry competency and get credentialed. If you’re a “people person” with good communication skills, you might want to consider a career in facility management. Strong interpersonal skills serve facility managers well because in their line of work, they meet all kinds of different people on a day-to-day basis. Facility managers must navigate conversations between clients, contractors, project managers, insurance agents, government officials, and anyone else involved with a job, communicating necessary information to all of them with ease and in a timely manner. They must also be able to effectively motivate their own team and keep morale high when things don’t go as planned, something that is inevitable in the world of facility management. If you’re a soft-spoken introvert who doesn’t like managing others or meeting new people, facility management is not for you. Successful facility managers are able to multi-task efficiently without getting overwhelmed, an important skill given all of the various moving parts involved with the job. On any given day, a facility manager may wear many different hats — salesperson, project manager, even technician. The job description of a facility manager is fluid so multitasking and being extremely organized is essential to success. The more organized a facility manager, the easier it will be for them to navigate through multiple projects successfully. While pre-planning and preventative maintenance take up a good portion of the job, facility managers also need to be extremely flexible because in this industry, unexpected problems will arise. This can come in the form of a natural disaster, a power outage, or a burglary. A new eco-friendly client might ask you to transform their office to make it “greener”, or new local legislation may pass that requires buildings in the area to make changes to comply with the new codes. Whatever the situation, facility managers must maintain flexibility or risk their client move on to someone else who better caters to their specific needs. 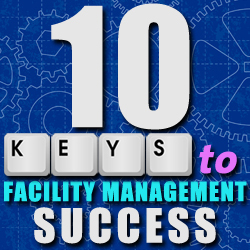 Being a facility manager is not for everyone and takes a lot of talent to succeed. But even while facility management isn’t always a cakewalk, the career is extremely rewarding in that you get to work with people on a daily basis in hopes of helping your clients better succeed in business. Think you’ve got the skills to be a facility manager? Take our Facility Manager Quiz to find out!